Books to share with YOU! There’s nothing like packing your entire house to realize you have too much stuff. And by “your” and “you,” I really mean “mine” and “me.” Too. Much. Stuff. I spent a good portion of the weekend packing and purging and organizing. We even loaded up the mini van and car with boxes and delivered them to our new house. The actual big move is happening Saturday. So this week is going to include more packing and purging and organizing and hauling. And there will afternoon breaks at the pool, if you were wondering. Probably some errands too. But while we’ve been uncovering all sorts of treasures and memories in our house and Greg and I have told the kids stories they may or may not actually care about, I discovered we have some duplicate chapter books that I want to share with one of you – well, really, the young reader in your life. Most of these are fairly classic children’s chapter books, but I put the suggested grade level next to them. Obviously, kids are across the board when it comes to reading, but as a point of reference my daughter who is going into fourth grade and reads well above grade level has read and enjoyed all of these in the past couple of years except “Tuck Everlasting,” which she and I are getting ready to read together. 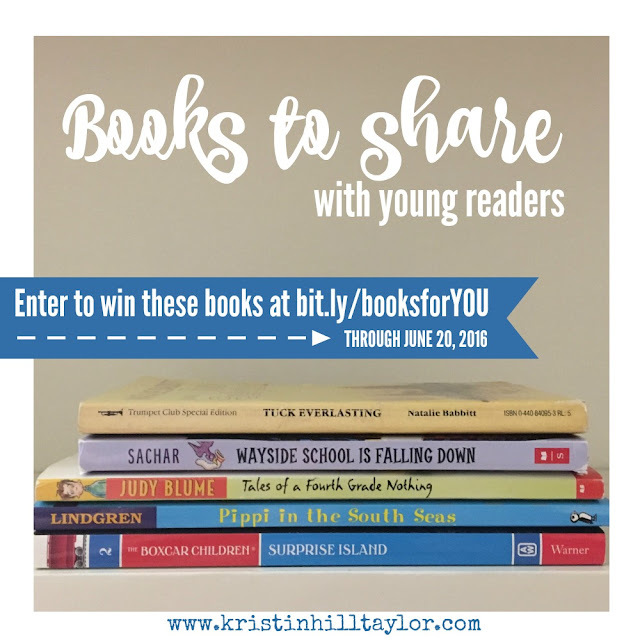 Back to the giveaway: use the Rafflecopter widget below for several ways to enter to win the stack of chapter books. The giveaway is open to only U.S. residents through next Monday. Then, from the comforts of my new house, I will choose a winner. Until then, happy reading. Subscribe to get new posts and/or a monthly newsletter with content not available on the blog in your inbox. When you subscribe, I’ll send you a FREE #choosingJOY printable.